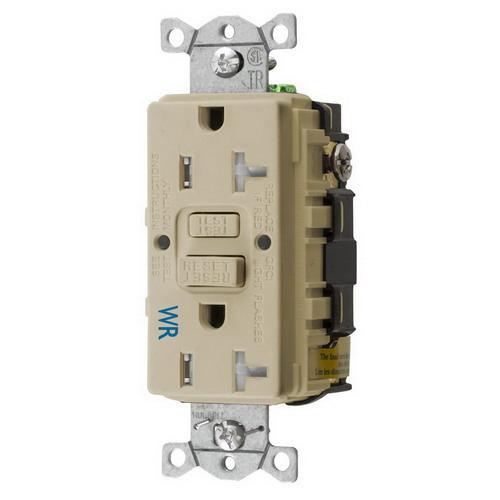 Hubbell-Wiring Autoguard™ 2-Pole 3-Wire Standard weather-resistant GFCI receptacle in ivory color, has current rating of 20-Amps and voltage rating of 125-Volts at 1-Phase. This commercial-grade receptacle with back and side-wired connection, accommodates wire of size 14 - 12-AWG. It has nylon face and base. Receptacle has brass contacts for optimal conductivity and heat rise resistance. It has power rating of 1 hp and short-circuit rating of 10-Kilo-Amps. Patented shutter design offers tamper-resistant protection. 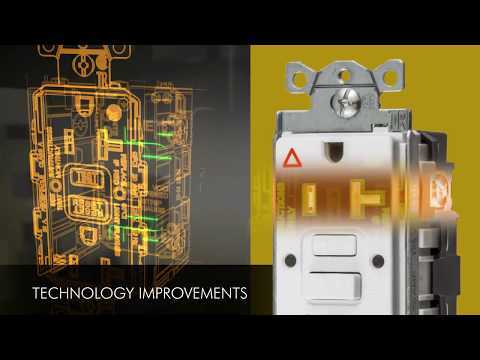 Receptacle has NEMA 5-20R configuration. Receptacle is suitable for harsh and damp applications. It measures 1.75-Inch x 1.47-Inch. Receptacle is flush mountable. Receptacle features zinc-plated steel strap for corrosion resistance. It withstands temperature rating of -35 to 66 deg C. Receptacle is UL listed, CSA certified and meets NEMA/WD-6/NEC/ADA standards.